e 16-day government shutdown impacted the IRS. The IRS reopened on October 17. 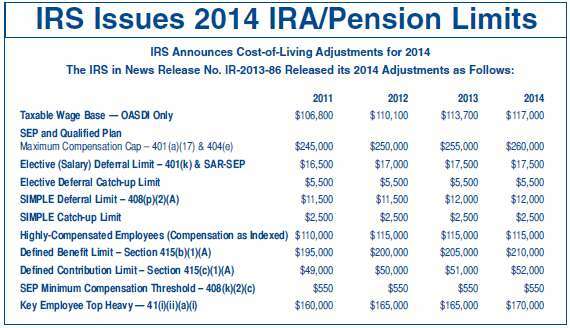 On October 31 the IRS released the 2014 IRA and pension limits. Inflation was very low for the fiscal quarter ending September 30, 2013, so many of the IRA and pension limits as adjusted by the cost of living factor have not changed or the changes have been quite small. The maximum IRA contribution limits for 2014 for traditional, Roth and SIMPLE IRAs did not change – $5,500/$6,500 and $12,000/$14,500 respectively. 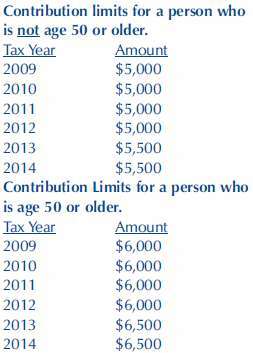 The maximum contribution limit for SEP-IRAs is $52,000 for 2014 up from $51,000 for 2013. 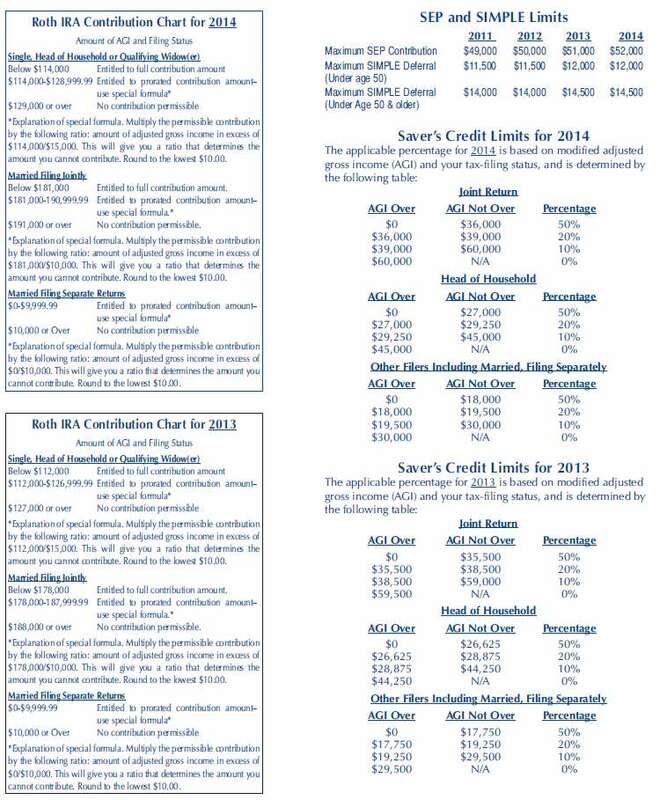 The maximum limits for 401(k) participants for 2014 are also unchanged at $17,500/$23,000. 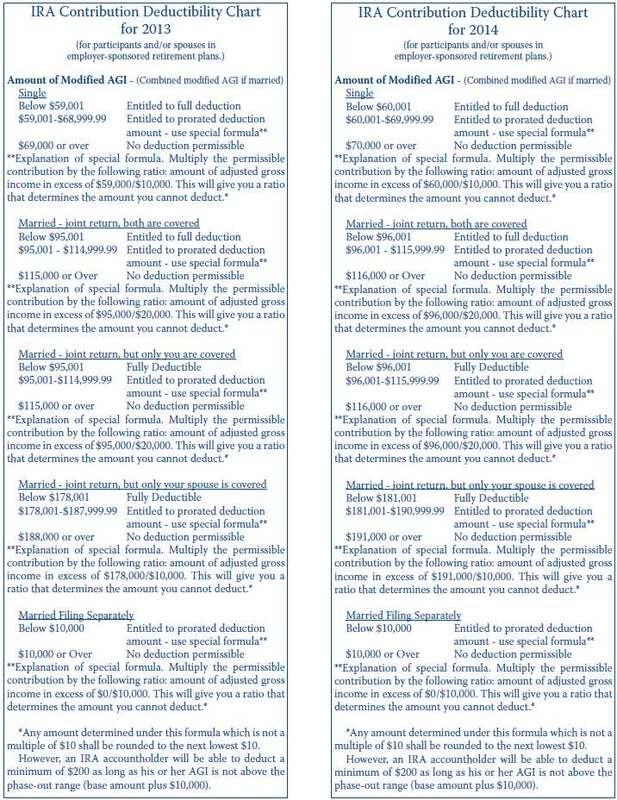 The IRA compensation limit changes were small, either $1,000 or $3,000. Your financial institution may have a customer who wants to rollover to an IRA an old Keogh that he or she has at another financial institution. Or, such customer may have the old Keogh at your institution. An institution wants to understand the tax laws applying to this situation so that it can decide what course of action should be adopted. A number of banks in 2013 called CWF regarding a customer wanting to rollover an old Keogh plan; we know some banks will call us in 2014. An old Keogh plan is one which the customer did not update as the tax laws required. For example, the customer’s most recent plan document was last updated in 1987, 1991, 1994, 2001, etc. Plans which once were Keogh plans in the 1970’s generally became profit sharing plans in the 1980’s and later. A person or business which established and maintained an old Keogh or profit sharing plan received substantial tax benefits. First, the sponsoring business, including a one person business, was allowed to claim a tax deduction for the contribution amount. The current maximum contribution for 2013 is $51,000 and is $52,000 for 2014. Second, the earnings on the contributions are not taxed until distributions commence. When a distribution occurs (actual or deemed), the amount withdrawn is in included in income and is taxable. When a plan document in not updated by an applicable deadline, the amount in the old Keogh or profit sharing plan is deemed distributed. This is true whether the individual knew of the deadline or not. The individual should have paid tax on this amount and an additional 25% tax is imposed when a person understates his or her tax liability. The individual is NOT entitled to resolve his or her tax problems by rolling such funds over into a traditional IRA. Distributed qualified plan funds are eligible to be rolled over into an IRA only if the funds are distributed from a “qualified” plan. A plan which has not been timely updated is no longer qualified. The IRS has a special correction program called Employee Plans Compliance Resolution System (EPCRS). The IRS has adopted this tax administrative program to promote voluntary compliance with the tax pension rules. The concept is – an employer which has not complied with certain tax rules is able to pay a modest compliance fee and modify the plan so there is now compliance. If this is done, the IRS will treat the plan as qualified so that a distribution will be able to be rolled over. The IRS compliance fee for not updating a plan document is in the range of $375-$750 if the plan covers less than 20 participants. The employer or the employer’s representative must make a special IRS filing. CWF’s fee to prepare such a filing would be in the range of $500- $1,500 as these filings are very time consuming. It normally takes 6-15 hours to prepare the necessary IRS filing materials. As you would expect, individuals in this situation may not be inclined to pay the IRS $375-$750 and certainly do not want to pay an attorney or accountant $500- $1,500. From CWF’s position, these individuals should jump at the chance to get tax relief by paying relatively modest amounts. An individual with a non-updated Keogh or profit sharing plan with $100,000 might well be required to pay $30,000-$65,000 in taxes, penalties and interest should the IRS discover his or her non-compliance. For this reason, one would think a person paying $1,000-$2,000 to resolve the situation is more than reasonable and is a prudent thing to do. Many people, however, don’t think this way. They don’t want to pay the IRS anything and they may learn a tax lesson the hard way. What if the old Keogh funds were located at another financial institution, the individual has withdrawn the funds, and he wishes to make a rollover contribution into his IRA? If a financial institution has information showing that the purported rollover is ineligible to be rolled over, it must not accept the contribution. A nonqualifying rollover contribution is an excess IRA contribution and a 6% excise tax will apply each year. For example, an individual rolls over $100,000 in December of 2013 even though if he is ineligible to do so. Ten years later the IRS audits this person and discovers the impermissible rollover. Since the $100,000 is an excess contribution, he will be owe $6,000 plus interest and penalties for each of the ten years. If the financial institution has no information showing that the plan is “old” and if the individual completes a rollover certification form, the rollover contribution may be accepted. What if the old Keogh funds have been located at your financial institution, but the plan was not updated when it should have been? A financial institution was and is allowed to discontinue its sponsorship of a Keogh or profit sharing plan document. As long as the the institution gave the individual notice that it would no longer be providing this service and would assist with a transfer to another financial institution, such institution should have no liability. You may inform the individual about EPCRS. If the financial institution may have some responsibility for the individual not updating his plan, then the financial institution and the individual should make a EPCRS filing to correct the situation. The two parties would need to decide how the costs would be borne or shared. One can expect the IRS and the bank regulators would impose substantially harsher tax and banking consequences if the sponsoring business has knowledge of plan errors and does not choose to use the correction methods which are available. Update on Profit Sharing Prototypes. The IRS appears to be on schedule to meets its April 1, 2014, deadline for issuing new favorable opinion letters to all prototype mass submitters, including CWF. Then, as in past years a sponsoring employer of a prototype plan is given 12-months in which to amend and restate its plan by completing and signing the updated adoption agreement. By doing so, the plan is considered to be qualified for the period of 2006-2011/2012.